Kumbh Mela or Maha Kumbh Mela is an occasion when millions of people take a dip in holy waters at the banks of holy rivers in India. During this period the largest gathering of people on earth on a single occasion takes place. It is an auspicious occasion for Hindus, who believe that by taking a dip in the holy waters during this period of Kumbh Mela all their sins get washed out and will attain Moksha or immortality and union with God. That too, especially, on this special occasion of MahaKumbh Mela which happens once in twelve years when all the angels bless them with bliss and eternal happiness. The spiritual bathing ceremony of Kumbh Mela (Year-2013) was in progress at Prayag Triveni Sangamam when this article is written during January 2013. Now, how it all started is not correctly traceable. 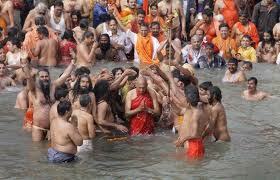 This practice of taking bath in the holy river waters was there since the time of our Puranas. The story goes that when the ocean of milk was being churned by Devas and Asuras (the demi-gods and demons) to get the nectar of immortality or Amrita, a fighting took place in between them to have the first share of it. And, to resolve the issue and make the Amrita available to Devatas only, Lord Vishnu took the shape of a beautiful angel, Mohini, and alluring Asuras flew away with the nectar. It was believed that during this incidence, the nectar or Amrit got spilled out at four different places and these four places have become holy places of rivers bestowing people with Moksha. These four places are Haridwar, Prayag(Allahabad), Ujjain and Nasik. So bathing in the rivers of Ganga at Haridwar, the Godavari at Nasik, Kshipra in Ujjain and Triveni Sangam or the confluence of three rivers of Ganga, Yamuna, and Saraswati at Prayag has become a popular ritual belief and practice since that time for attaining immortality or moksha. As the battle took place for full 12 days and nights before Mohini flew away with the Kumbh or the pot containing the Amrit, the Kumbh Mela came to be celebrated at every 12 years commemorating that battle and the spill of nectar. It is believed that the time period of one day plus one night of the Devas and Asuras was equivalent to one year of human beings. So the Kumbh Mela came to being celebrated at a gap of each twelve years. 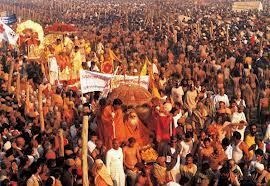 The Kumbh at Prayag (Allahabad) is celebrated when the Sun enters Capricorn sign or Makar rasi. It begins on 14th January (Makar Sankranthi Day) and lasts up to Maha Shivarathri for a period of 55 days or so. The events at other three places are celebrated on different periods. At Haridwar, it is celebrated when the Sun enters Aries sign or Mesha rasi. At Nasik, it is celebrated when Sun enters Leo sign or Simha rasi. And, at Ujjaini it is celebrated during the period when Sun is in Scorpio sign or Vrischik rasi. It is a great amazing event where people of various faiths and beliefs gather together leaving behind all their differences. Rich and poor, educated and illiterate, children and young and old age people, politicians and business class and all types of people from all over the world gather there with the only wish of taking a dip in the holy waters and attain moksha. The first day of the bath is most significant as Naga Sadhus of 13 akharas take processions with elephants, horses and chariots and music bands wearing simply nothing or scantily and take bath in groups at predetermined places for them. The civic administrations make elaborate arrangements on these occasions to control the free flow of pilgrims to the ghats and for their amenities and safety. Numerous tents are erected for changing clothes and taking rest. Security posts and helplines are arranged with 24-hour service to look at their needs and problems. Even though throughout the whole period is auspicious for taking the bath to attain moksha, some days are believed to be very very auspicious for attaining the eternal bliss of immortality like Makar Sankranthi, Poush Poornima ( Pushya Purnima), Basant Panchami, Ratha Saptami, Bhisma Ekadashi and Maha Shivarathri on which days it is believed that people directly get union with God after death. The Ardh Kumbh Mela will be held in the year 2019 at Prayag (Allahabad). P.S. Images are from google images.